A Labrador is a medium-sized dog with double coats of short hair and is a medium but constant shedder. 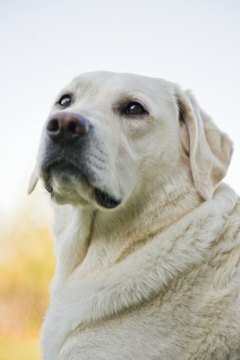 You can shave your Labrador during the shedding phase to minimize the amount of dog hair in your home. The amount of shedding depends on the color of your dog. Yellow Labs shed throughout the year but at a slow pace. A black Labrador, on the other hand, may shed its entire coat in the spring and during the fall. Procure your tools. You will need a short-haired rake to remove as much of the dead hair as possible. You also need a narrow-toothed comb and a clipper with two speeds and interchangeable blades that will be suitable for the thick double coat of the Labrador. The clipper should be sharp and powerful yet safe and quiet to use around animals. For a Labrador with thicker fur, you will need a clipper with speeds up to 4,200 strokes per minute. It will take at least three different types of blades to shave your Labrador. The No. 7F blade will be needed to shave the body. Blade Nos. 10 or 15 are recommended for trimming under the pads of the paws and around the private parts. Bathe your dog a day before you shave its coat. Never shave a Labrador with a dirty coat as this will dull the clipper blade. Bring your Labrador outside and rake all the dead hair that can impede your progress when shaving. After raking all the dead hair, your Labrador will be left with a coat that will be ready for shaving. Remove matted hair that the rake may have missed with a narrow-toothed comb under the chin and around the ears, as well as the tail. Combing will loosen the hair from the skin and will be helpful when shaving. Get your Labrador used to the electric shaver by shaving a portion of its leg. If there is no drastic reaction or movement from the dog, it will be easy for you to shave your dog. Choose an area outside where your dog is familiar. Make sure it's a place that offers no distraction for your pet and where you can work comfortably. Place a muzzle on your dog if it has a tendency to nip. A harness will be ideal to keep the dog still. Get an assistant to help you keep the dog still. Stand the dog on a table to make it easier to move around as you shave without taxing your lower back by bending. Clip longer hairs first with a pair of sharp scissors. Start with the difficult areas first. These include under the chin, around the eyes and near the ears. Set the electric shaver to the No. 10 blade setting and begin shaving. Lift the dog’s head and shave under the chin, pulling the loose skin taut while you shave. Trim along the jaw line toward the ears. Hold the ear with one hand and give it a slight pull to keep it stretched out as you go over the ear. Move to the other side of the face and shave along the jaw line and do the other ear. Go slowly when you shave around the eyes and the muzzle. Set your clippers to the No. 7 blade and do the legs next, trimming the longer hairs behind the knees and between the paws of the Labrador before you shave the tail, deciding on whether you want to keep the curly hairs on the tip of the tail or trim it. Once you have finished shaving the difficult parts, finish the rest of the body. If you do change your mind about giving your Labrador a shave, it is recommended that you give your pet regular grooming by brushing the dog’s hair with a stiff bristle brush to remove dead hair and minimize shedding by stimulating the oil glands. Shave your Labrador if you feel it will make your dog feel better and it is quite a chore for you to constantly remove dog hair around the house. Do consult with the vet if your Labrador is shedding too much. Maybe a change of diet will do the trick. Ken Hamilton started writing professionally in 2005. His work on various subjects such as sports, business and travel has been published online for Business.com and Alabama Travel. He is a successful entrepreneur who has started and sold numerous businesses. Hamilton holds a Bachelor of Science in business from the University of North Alabama.